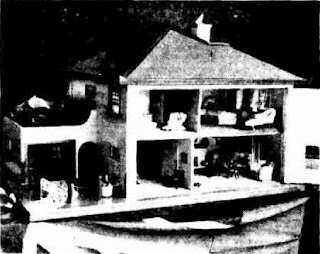 I've been having fun looking at mentions of dolls houses in old Australian newspapers. 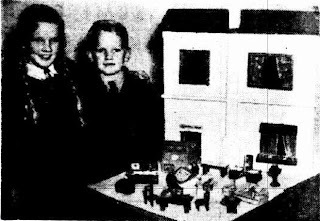 I've noticed that quite a few dolls houses were raffled during WWII, to raise money to support the troops and prisoners of war. In Tasmania alone, the Tasmanian newspaper The Mercury reported on over 12 dolls houses donated for raffles. Some were made especially for the raffle, some were old childhood or family dolls houses. 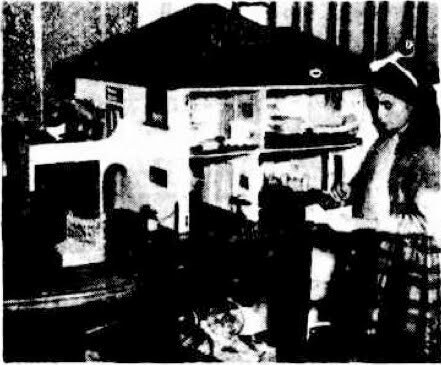 The Mercury was also particularly good at showing photos of the dolls houses, and I thought you might be interested to see them. This dolls house was made by the employees of Nettlefold's Bodyworks, Hobart, in their spare time. Mr Bernard Walker (an architect who was involved in the development of the Cadbury Estate in the 1920s) designed the dolls house, and Miss L. M. (Maud) Poynter (a potter and painter) and Miss E. (Spring) Reid made the furniture and fittings. It was described as a very modern dolls house, "modelled on the lines of a modern home, and fitted throughout with snappy miniature furniture." The lounge, bedrooms, bathroom, kitchen, and dining-room are all completely furnished down to the tiniest detail. Real carpets are laid down and the rooms are fitted with electric light. A special feature is a roof garden, complete with swing seat and a large sun umbrella. Special pottery equipment and dolls were made by Miss Poynter. The house is painted in cream and has a brown roof. Two months later, in May 1942, another dolls house, fully furnished and with running hot and cold water, was donated in aid of the Air Training Corps equipment fund. This raffle also realised £100; the winner was Miss Diana Rex, c/o Mr. G. Rex, Morrison St., Hobart. Sadly, there are no photos of this house with its running water. 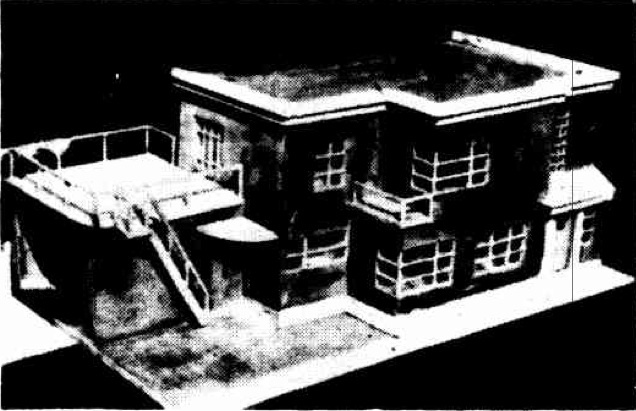 Although the maker is not named, F. X. de Bavay was responsible for placing the announcement of the winner in The Mercury; he is named as the maker of another dolls house in 1945, so perhaps he made this one too. 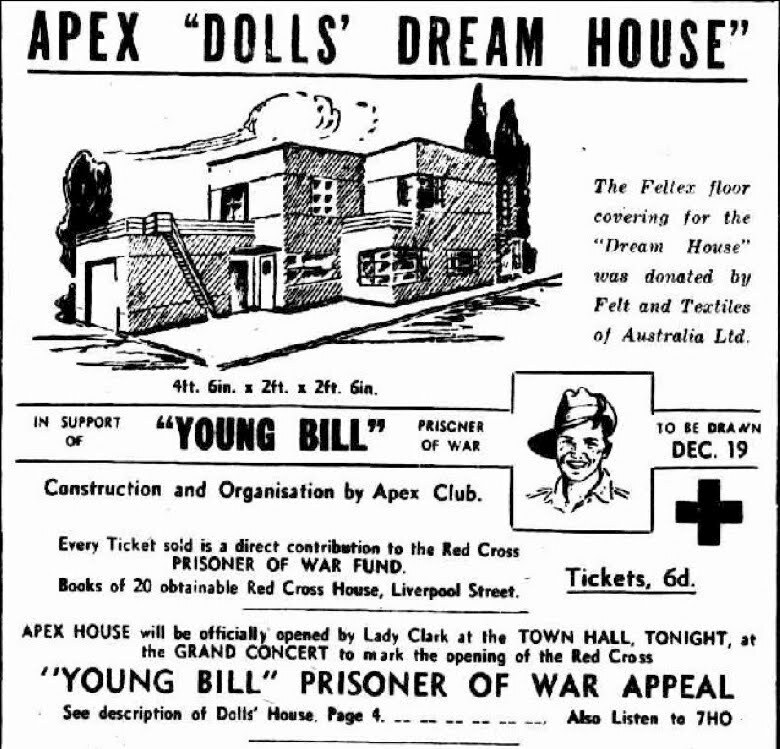 Then in October 1942, members of the Apex Club of Hobart designed and built the "Dolls' Dream House", which they donated to the Red Cross "Young Bill" prisoners of war appeal. This house measured 4' 6" by 2' by 2' 6". It had a sun roof and a garage, and the furnishings included tiny carpets, bedsteads, blankets, pillows and pictures. Most of the furnishings were made and donated by Peter Eldershaw, then a patient at Wingfield House for crippled children (he later became principal archivist, State Archives of Tasmania). A Mrs Basil Crisp donated a Parisian teaset to the house in the second week of the raffle. 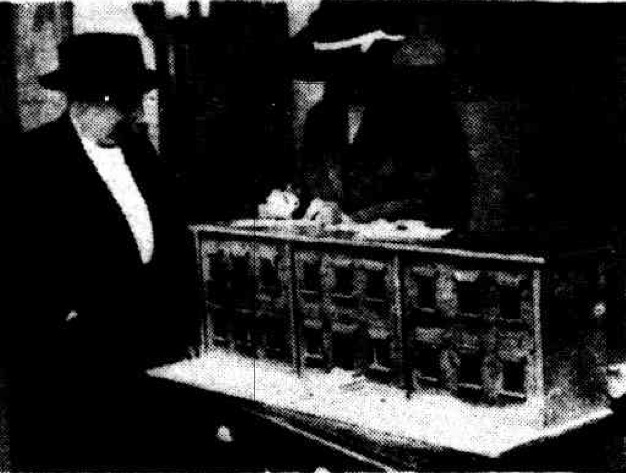 The dolls house was exhibited in Hobart, Launceston, Burnie and Devonport, and regularly reported on in The Mercury. The manufacturers of the materials used to make the dolls house took advantage of the massive publicity to advertise their products. Here, we are informed that "The Feltex floor covering for the "Dream House" was donated by Felt and Textiles of Australia Ltd."
"MASONITE, "the wonder Board with a Thousand Uses," was used in the construction of the Dolls' Dream House. This Advertisement is inserted by the manufacturers, THE COLONIAL SUGAR REFINING CO. LTD. (Building Materials Division), to assist in the war effort." "The painting of the Dolls' Dream House was carried out entirely in "Dulux." This advertisement is inserted by the makers, British Australian Lead Manufacturers Pty. Ltd., to assist the war effort." A dinghy was raffled at the same time as this dolls house - between them, they raised £516. 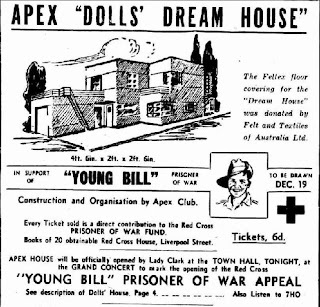 The winner of the dolls house, drawn at an Apex Ball on December 19th 1942, was Elsa Young of 35 Tennyson Street, East Malvern, Victoria. Did she take her dolls house home to Victoria, I wonder? In May 1944, two Hobart children made a dolls house for the Red Cross. They called it Austerity House, because it was made from "boxes and "bits and pieces" at the cost of 1/." The children were Brian Kemp, aged 8, and Ann Kemp, aged 10; their father, LAC Wilfred Kemp, was in the Royal Australian Air Force. Brian had already made models of a man-o'-war and a hospital ship, which he had donated to the Prisoners of War shop. Ann was "an accomplished knitter, making her own jumpers and cardigans, and now knitting her first pair of gloves." She made "vases and pot plants [for the dolls house] from coloured bottle tops, and match boxes and cotton reels were used in the construction of the furniture." This dolls house was won by Betty Groombridge, of Lower Longley. 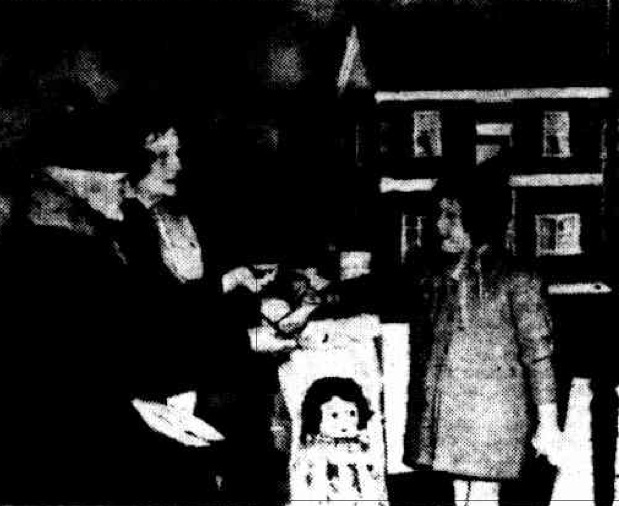 Catherine Macleod of Richmond was one of the people who donated her childhood dolls house in aid of the war effort - it was "most attractively refurnished by Mrs J. Eldershaw and her son, Peter" (who furnished the Apex dolls house, above) before being raffled for the Red Cross in May 1944. Another old dolls house had been donated to the Battery Point Red Cross at the end of 1943. This wasn't just a childhood dolls house - it was nearly 100 years old! Ouch! They are leaning on an antique, 3-winged Georgian dolls house to write the raffle tickets!! It ... is in an excellent state of preservation. Only a comparatively small amount of renovation was necessary, and this was undertaken by Miss Poynter, who is well known in the world of art, and is a keen worker for the Red Cross. Most of the furniture is the original, and a feature is a fascinating little writing desk complete with candlesticks. The remainder is more than 50 years old, and is in perfect order. What an amazing piece of Tasmanian history. It would be one of the oldest dolls houses in Australia, if it still exists. Strangely, this raffle was to be drawn after only one week - I wonder how much it made, compared with the raffles that went on for weeks with huge publicity. The winner was J.S. Ramsay of Launceston. I'm going to try tracing this house! "Housing problem solved - for this little lady at any rate! She was purchasing a ticket in the doll's house raffle in connection with the Allies' Day Appeal yesterday." Finally, in February 1945, F.X. de Bavay, master brewer and general manager of the Cascade Brewery, made a dolls house which he called the Victory Doll's House. He donated this house to the Tasmanian Society for the Care of Crippled Children and thc Tasmanian Sanatorium, so it wasn't strictly speaking in aid of the war effort - but the name certainly referred to the war! The winner of the Victory Doll's House was Miss Sallie Hall, of 10 Tasma Street, Launceston. Does anybody recognise the Nettlefolds' house, the Dolls' Dream house, or the Georgian house? They are all fairly distinctive - if they have survived, they would be quite easy to recognise, I think. I'd love to know where they are! Hi Christine, thank you - I think the best bet is someone googling on Tasmanian dolls houses, or something like that - the way Amanda found my post about Molly Fox's dolls houses, and emailed to say she owns one of them. I will do a bit of detective work, too! Thank you, diepuppenstubensammlerin - somehow I doubt it! But I think I'll email it to the Tasmanian Museum, and also the National Trust of Australia (which hosted the exhibition of Australian dolls houses 10 years ago). There was a book at the exhibition for visitors to write in, especially if they owned an old dolls house. I did, and didn't ever hear anything - but back then, I only had the two Lines houses and the cupboard house, none of which are Australian. I don't know what happened to that book, or if anyone followed up on any other dolls houses mentioned ... something to find out! What a beautiful history! I hope you find them again! How beautiful, all this war effort using creativity and bringing joy to children. Brian Kemp was a talented boy, I wonder what happened to him when he grew up? Hi CM, a Tasmanian miniaturist has made the excellent suggestion that we approach The Mercury newspaper to run a story about them - so maybe we will find them! or one or two .... A house with cold AND hot running water would be pretty amazing! Hi Lynne, yes, wonderful, isn't it? There were also dolls made and sent to the UK or Europe, I seem to remember ... and quite a few 'Wanted' ads in the classifieds, seeking dolls or tea sets or whatever - or even a dolls head (presumably to attach to a homemade body), for presents. I'm not sure about Brian Kemp - there is a Kemp family collection in the Tasmanian Archives, and google finds Wilfred Kemp demonstrating his woodturning skills, so talent at making things obviously ran in the family. I think Brian may be the current Secretary of the Sound Preservation Association of Tasmania - I could contact him, and see if he's the same Brian Kemp! Funnily enough, Rebecca, I have dropped that society an email for that very reason. Young Brian would make a fabuus subject for a YA book.